Ranging from the simple, the elegant and classic right the way through to elaborate and bold, you’re sure to find a design to complement your wedding. The process of picking, personalising and sending the invitations is both simple and intuitive. Editing a design and adding event details is easy and you can even customise the postmark and stamp on your ‘envelope’. We love that guests can interact with each other on the message board. It helps break the ice and is a good way to arrange car shares, coordinate travel or share tips on accommodation. It’s great that there’s a central hub with all the important details on. This should help you to fend off the million and one questions that guests usually have on the run-up to the big day. We’re positive that you’ll find something to fit the colour scheme of your wedding, but if you’d prefer a bespoke design, you can use the Personal Design Service, and they’ll edit an existing design or custom make one. One of the BIGGEST features is being able to track each invitation including seeing who's opened the invitation and who hasn't. 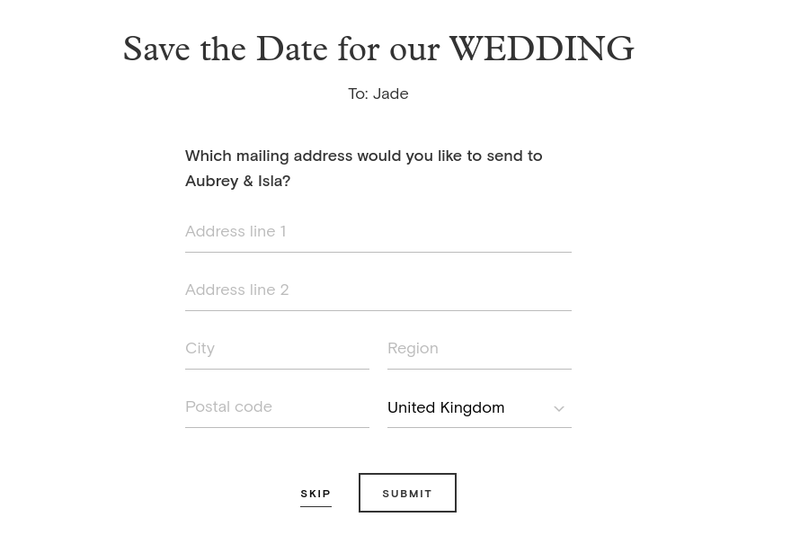 Collecting RSVPs can be a nightmare but this makes it simple, allowing you to efficiently manage your guest list. You can send messages to individuals, groups or entire lists of people, too. This will save you a ton of time. Love the digital designs but interested in sending it out by paper? Not a problem. Paper Source is where you can shop for paper cards and invitations. It’s not all about the ceremony and reception, either. You can choose superb designs for your hen or stag party, save-the-date, engagement and rehearsal dinners. It’s really easy to set-up and start creating your invitations. The coin system means that you’re in control of your budget – no nasty surprises. The step-by-step process is simple and straightforward with plenty of help on hand if you do run into any problems. It’s not just about weddings, either, as you can send digital invitations for baby showers, birthdays – any event you’re hosting. It’s as simple as sending an email. You can choose the date the invitations are sent out and it’s easy to add any additional invitations if you’ve forgotten Auntie Anna or cousin Jimbo. It's fair to say that we were super impressed by Paperless Post. Wedding etiquette be damned, if all e-invitations are as stunning as these, as easy to send and as stress-free to manage then we say – long live digital invites! Explore the range of beautifully designed digital wedding invitations on the Paperless Post website.